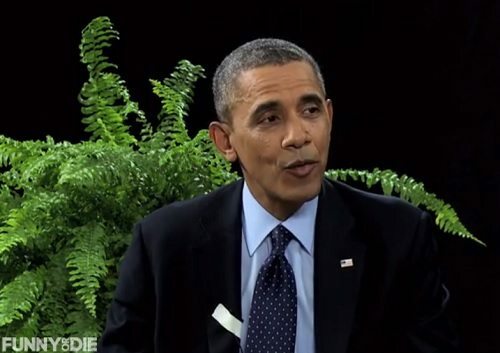 Episode 18 of Funny or Die’s Between Two Ferns has Zach Galifianakis interviewing President Obama. The president does a fine job as the straight man for Galifianakis and the video is already a viral sensation. However, if you think that the president was just feeling like delivering some humor with the star of The Hangover, think again. The joke at the end was that the show was shot in the White House Diplomatic Room, which Galifianakis said had always been done—with President’s Bush’s permission. The president handled lots of the jokes well, including Galifianakis’s suggestion that the president locate his presidential library in his home country of Kenya and his question about possibly sending Hulk Hogan or Tonya Harding to Syria in the wake of Dennis Rodman going to North Korea. But the show was clearly an opportunity for the president to plug the ACA and healthcare.gov on a show likely to be seen by the young adult target demographic that the ACA needs.